Short trips cost less and keep the kids involved! 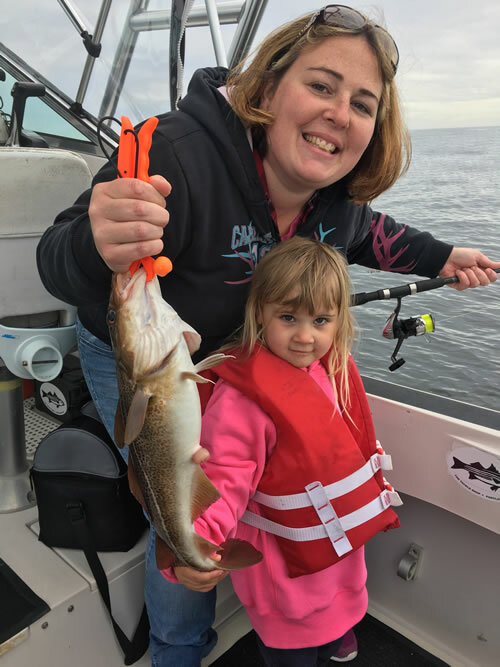 When it comes to Family Fun Fishing aka “Short Trips” most of the fishing takes place within 5 miles of the coast. Fishing closer to land ensures calmer waters which is great for families with young children. If you choose this trip type, usually within 15 minutes you will be at the fishing spot. Shortly after, you will be dropping baits to the bottom targeting the smaller more plentiful fish which is perfect for fishing with kids. Captain Ben finds this to be a good approach for children as they have higher odds of success and it keeps them busy and interested. Captain Ben will be happy to fillet and bag any legal sized fish you wish to keep or is happy to catch, photo, and release, it is up to you. On the way out of historic Portland harbor you will pass many lighthouses including Portland head light the oldest working lighthouse in the United States and one of the most photographed lighthouses in the world as it was commissioned by George Washington. Common sites are also harbor seals, osprey, bald eagles, porpoise, and small whales which is all very exciting for the family. In addition to the lighthouses, you will pass several old revolutionary war forts scattered about Portland Harbor.